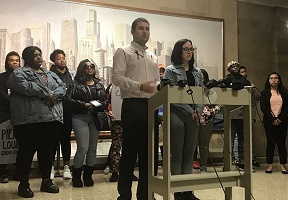 Student from Parkland high school in Florida and Good Kids Mad City (GKMC) from across Chicago held a press conference on Monday, June 11th outside of Mayor Rahm Emanuel’s office, to address the recent police shooting of Maurice Granton and the gun violence in Chicago. Good Kids Mad City students were joined by students from Parkland, No Cop Academy, March4OurLives, Simeon Youth Activist, The VOYCE Project, Assata’s Daughters, members of Maurice Granton’s family. 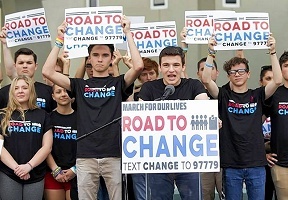 Good Kids Mad City along with Parkland students are demanding justice for teens across the country who’ve suffered from gun violence. Speakers called for police accountability from the Mayor’s office as another young Black person was recently gun downed by CPD. GKMC wants community revitalization now, which includes investment in schools, youth job development, mental health care, trauma informed schools and community centers that focus on restorative justice.